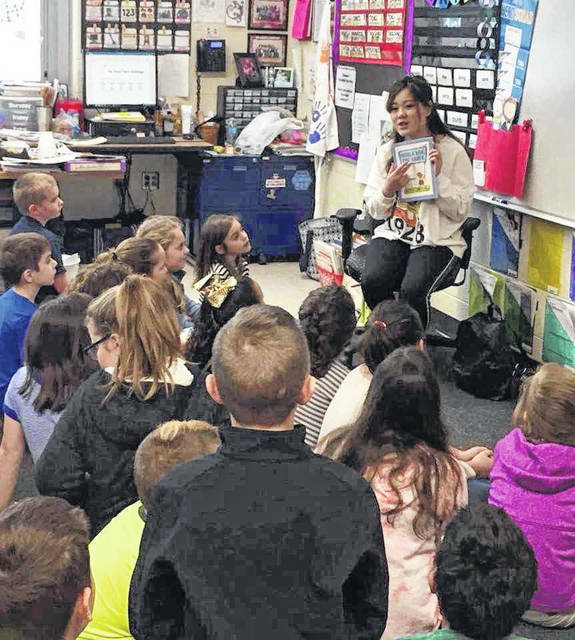 Olivia Li, intern for the International Programs and Services department, reads to students at Rio Grande Elementary. Li is the first international student to graduate from the Master of Education in Integrated Arts degree program. RIO GRANDE — The University of Rio Grande and Rio Grande Community College has been continuing to expand its global impact by strengthening its partnerships with universities in China. The partnership includes student and faculty exchanges between Rio and its Chinese partners. Within the first year of the partnership, the exchange has already expanded to include graduate students seeking master’s degrees. Li Xi, who goes by Olivia on campus, is a 2016 graduate of Baoji University of Arts and Sciences in Baoji, Shaanxi Province, China, where she received her bachelor’s degree in Business English and was awarded the honor of Outstanding Graduate. She first came to Rio from her home town of Shangluo, Shaanxi Province, China, in the fall of 2017 to finish her graduate studies through the newly re-introduced Master of Education (M.Ed.) in Integrated Arts. Li said she has enjoyed her time in the program. The integrated arts program rationale states that students who participate in the arts develop confidence, strengthen collaborative skills, and expand capacity for critical, interdisciplinary thinking. After her May 2018 graduation, Li will be staying at Rio through the summer to take additional summer workshop classes through her program. Li said the program has introduced her to new ways of teaching and interacting with her future students once she enters the teaching field. While earning her degree this year, Li has also interned with the International Programs and Services department at Rio. International Programs and Services Director Dr. Eric Yang said Li has been a great and resourceful intern for IPS and is very focused on her classwork. Li is the first student from the Chinese exchange program to earn a master’s degree at Rio. She said she is still looking at options for her future career, including the possibility of teaching in Southeast Ohio.